Under The Gun Review sent photographer Kellie Gannon to Blossom Music Center in Cuyahoga Falls, OH to shoot The Boys of Zummer Tour on June 16. The Boys of Zummer tour rolled up at Blossom Music Center on a perfect summer evening. Pittsburgh rapper Wiz Khalifa teamed up with Chicago’s pop punk sweethearts, Fall Out Boy, to provide an unrivaled outdoor concert experience for thousands upon thousands of fans in attendance. Wiz Khalifa kicked off his hour-plus-long set with the perfect summer tune, “Roll Up,” and immediately the crowded lawn beyond the amphitheater was overcome with a very obvious, smoky haze. Despite his small stature, Khalifa made sure to cover the expansive stage running from side to side working the crowd, and eventually running out to a second stage on the lawn for “Taylor Gang.” Khalifa had a live band and DJ that pulled out all the stops, especially on songs like “Work Hard Play Hard” and during his emotional, one-song encore, “See You Again,” off the recent Furious 7 soundtrack. Fall Out Boy took the stage after a brief DJ intermission, striking an instant chord within my nostalgic teenage heart during opening song “Sugar We’re Going Down.” Patrick Stump kept the crowd dazzled with his soulful voice, while FOB played energetic, hard rocking tunes off their most recent release, American Beauty/American Psycho, a lovable album with an evolved, electronic, and generally radio friendly sound. 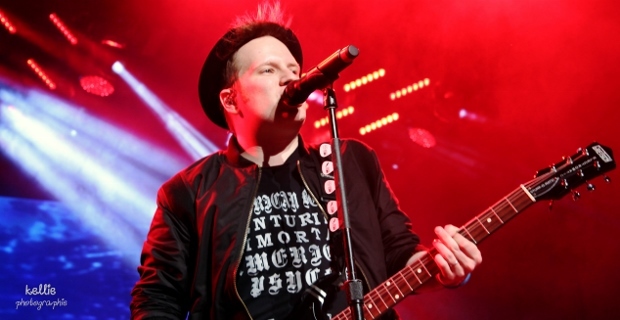 Between new tunes including “Uma Thurman” and “Irresistible,” FOB’s diverse 18-song set list was also chock full of the most memorable classics from their expansive discography. The Boys of Zummer tour still has an entire summer full of dates, so be sure to check out this fantastic line-up! Enjoy the photos below of Wiz Khalifa and Fall Out Boy in all their glory. Saw them in Camden, NJ and Columbia, MD and they ROCKED both times! Amazing concert! !